Insulating ladders & stepladders are to protect a worker against electrocution whilst working in a potentially hazardous situation – ladders insulate the worker from earth. 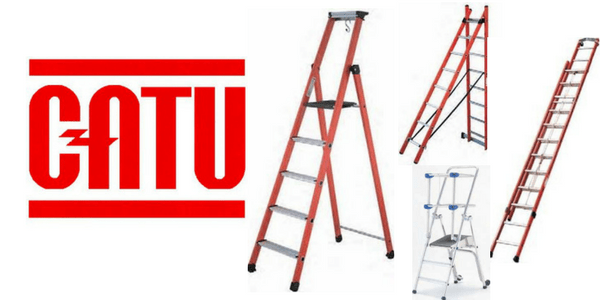 CATU insulating ladders are fire resistant and have good strength/weight ratio. CATU’s insulating ladders are also resistant to corrosion and ageing due to exposure to the elements. Insulating ladders & stepladders are available with extended heights. The MP-510/2 10.26m long insulated ladder was selected for use in the Channel Tunnel for maintenance work. CATU insulating ladders are approved according to EDF specification KR 78 C-B216. EN 131 is the British & European Standard that all CATU insulating ladders & stepladders must comply to – there are three main classifications of ladder; Class 1, Class EN131 and Class III. Each classification indicates the safe working load that a ladder is designed to support. EN 50528 is the British & European Standard for all CATU ladders for use on or near low voltage electrical installations. CATU provide a complete range of Electrical Safety Equipment & PPE for personnel protection, including insulating gloves and insulating matting for medium and high voltage electrical protection.